KNIGHT Pneumatics has introduced the new range of Oz-Air drum pumps. With no moving parts and all stainless steel construction, the pump carries a 10-year guarantee. The Oz-Air drum pump pulls liquids quickly, efficiently, and directly into sealed drums. 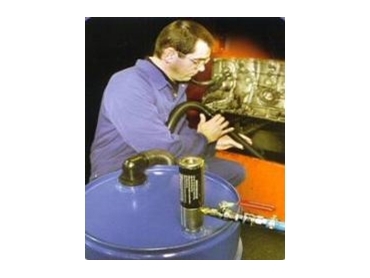 Operating on compressed air only it has no moving parts and therefore requires no maintenance. The pump removes liquid product without losing prime. The pump will also pickup sludge, metal chips and other debris which often clog and harm other types of pumps. The liquid product is safely drawn into the drum ready for disposal. Applications include accidental spills, lathe coolant tanks, product transfer, and pump priming. The kit includes Oz-Air drum pump, ball valve, 2m of 40mm hose, wand and extension wand, vac head, and crevice tool. * Fast and efficient operation, contain spills quickly. * Simple and safe operation. * Fast setup, install on drum in less than a minute. * Automatic Safety shutoff valve to prevent overflows. * Light to heavy fluids able to be moved.